Commercial Building with Commercial Lot; Lot Area: 1,819 sq.m., Floor Area: 800 sq.m. 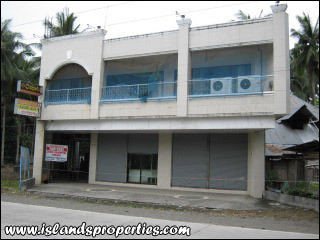 This is a 2-storey commercial building with commercial lot. It has stairs going to the rooftop. Rooftop flooring is fully cemented with bars for column making, ready for 3rd floor extension. Foundation and column were built in japanese standard. It is spaceous and all flooring is tiled. It has 6 sliding doors and 2 steel doors. The 1st and 2nd floor frontage is covered with glass. A steel gate with steel stair at the back of the building as exit. A stainless tankat the rooftop and has an existing generator. In the 1st floor, it has 6 toilets and 3 baths and in the 2nd floor, it has 2 toilets and 2 baths and a centralize aircon. The lot is fully fence with finish concrete. It is suitable for hotel business or company office.